Winners for the Hawk’s Well Theatre’s iYeats Poetry Competition 2016 have been announced. This year’s judges were poets Moya Cannon and Colin Dardis. The winner of the general poetry prize is Niamh Prior for her poem, Lagan. Highly commended in the general category are Niamh Prior (Practicing), Breda Spaight (Her Cross) and David Butler (Exodus). The winner of the emerging category (for poets of 16-25 years of age) is Laura Herlihy for her poem titled Capped Boots. Highly commended poets in the category are Sean Flynn (Mnemonic Device) and Michal Leibowitz (May Psalm & There Were No Tulips). Over two hundred poems were entered into the competition and both judges commented on the very high standard of entries. The iYeats Poetry Competition was launched by the Hawk’s Well Theatre in 2009 in order to help to continue to foster the craft of poetry. It is an annual, online, international poetry competition which has won a prestigious reputation for the calibre of both entrants and judges. The competition is open to all those of 16 years of age and upwards. 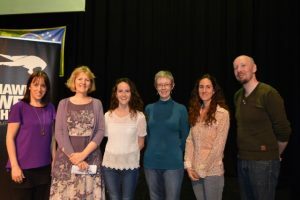 The winning poets of iYeats International Poetry Competition are honoured at a prize-giving ceremony at the Hawk’s Well Theatre during the Yeats International Summer School and the winning poems in both categories can be viewed in the theatre foyer. ‘Lagan’ is a deeply mysterious poem, surreal and, at times, even playful, but carrying huge emotional ballast. There is a strong narrative thread, sustained by finely textured, sensuous language and a skilled use of imagery. “I skimmed my fingertips over his ribs,/his metacarpal bones, those coral twigs”. The speaker’s combination of detachment and tenderness allows us to accompany the writer on a journey to the depths and back. The competition attracted a lot of poems on the theme of death, but ‘Practising’ stood out for its mixture of black humour and despair. From the formality of its opening to the descent into a comedic back-and-forth, onto its stark ending, this is a well-crafted and highly enjoyable piece. ‘Her Cross’ is full of savagery and helplessness, one of the few poems that made me feel sorry for the speaker. Lines of commentary on the father mixed in with the action result in a harrowing portrayal of childhood, topped and tailed with unexpected lines that made this a stand out poem. ‘Exodus’ is full of sharp, intelligent imagery – “a tiny Gulliver” for instance – packed into a relatively brief poem. There has been plenty of poems written recently about the plight of immigrants and the shock over certain scenes in the news; ‘Exodus’ is as concrete, focused and impactful as a newsflash, one that resonates with current times. The opening line of ‘Capped Boots’ – “When B’s looked like D’s” is cleverly reflected in the proceeding word choices, such as “labelled” and “dumb”. The image of white-collar school shoes being exchanged for blue-collar work boots is particularly effective, a restricted life choice summed up in one small detail, whereas the last stanza just cries out wretchedness. Overall, it captures a certain desolation without being maudlin or apologetic. ‘May Psalm’ is a deceptively quiet poem. The language is understated and fresh ‘The fields are shaved/ with silence’. It is a poem which does not quite yield up its secret, nor does it wish to. Yet in a very few lines the writer succeeds in conveying a sense of unspeakable loss. The imagery in ‘There Were No Tulips’ is stark and vivid ‘…the crows stayed./Ruffled their skins from the telephone/wires. Crowed as they were wont to do.’ The jagged, enjambed lines convey a sense of tension. The writer strikes a good balance between telling us enough and not telling us too much. ‘Mnemonic Device’ The writer uses the mnemonic of counting knuckles and the gaps between them to establish whether a month contains thirty or thirty-one days. The image then resonates at the level of a personal relationship, bringing the abstract and the tangible into dialogue in a most interesting way.